Our AGM is approaching – Tuesday February 5th, 7pm at the Nowra School of Arts. If you are a current financial member please come along and use your vote. We would welcome all genuine nominees for Committee positions, including President. You will be asked to introduce yourself as a potential Committee member before voting takes place. Let’s move into 2019 with a strong Committee to take us through the exciting shows for the year. The attached document outlines how you may assist a fledgling group in Nowra called the Creative Company. If you are interested please get in touch with Fiona. Our second tri monthly meeting for 2018 will occur on Tuesday 18th September at the Nowra School of Arts at 7.45pm. You will be in for an entertaining evening….a pleasant surprise for anyone who joins us. I am truly delighted with the show season we have just had of “Mary Poppins”. Our large, and at times full capacity, audiences were astonished and amazed by the talent we exhibited on stage and in the orchestra pit. 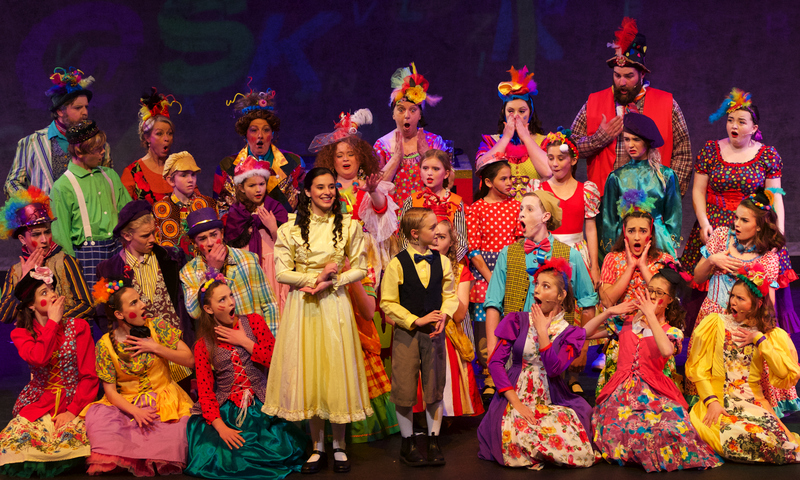 Thank you to ALL our performers and crew who worked tirelessly to bring a fabulous show to Shoalhaven audiences. It was all ‘practically perfect in every way”. “SHREK Jnr” will be commencing the Information and audition process soon. On Wednesday 2nd May: we will resume JAM at the Nowra School Of Arts with an introduction to “SHREK Jnr” from 4.15pm to 6pm. All our JAM performers are welcome and we would encourage ANYONE who expressed an interest to be in “SHREK” to attend. This will be an active drama session getting to know the characters of the show. We will be asking for an audition EOI from the participants for some of the solo characters of the show. On Wednesday 9th May: 4.14pm to 5.45pm we will be going through some of the ensemble songs from “Shrek”. Once again we would encourage ANYONE who wants to be in “SHREK Jnr” to attend. From 6pm to 7pm on Wednesday 9th May we will be holding an Information session for parents to find out about our “SHREK Jnr” audition, rehearsal and show plans. Wednesdays 16th and 23rd May will be scheduled audition afternoons for some of the solo parts. Further information will be posted. Not everyone will need to attend. Please be aware of the AGM taking place on Tuesday Feb 6th at the Nowra School of Arts at 7pm. We would welcome new Committee members who are keen to put in the hard work, time and responsibilities required of the Committee. We would also welcome enthusiastic Company members who may like to participate in 2018 by being on a sub-committee to assist with matters such as fund-raising, grant applications, costumes, props, technical supervision, maintenance of resources and other administrative business. As AMTC business has expanded we realise there is more than the Committee can handle and we are happy to share the increased work load with others who may not be prepared or able to put themselves forward as Committee members. There will be a tri-monthly meeting on Tuesday evening, October 3rd from 7pm, at ‘The Shed’, 68 Meroo Rd Bomaderry. Please come along to hear all that has been happening for the Company in the last few months. It has been a busy year! Take a peek at some of the “Little Mermaid” set, and join us for a cuppa after the meeting. This team would be working to bring a classic French revolution crowd pleaser to our Shoalhaven audiences in November 2018. Production dates are expected to be from November 10th to the 24th,. Auditions and rehearsals would probably commence in July 2018. AMTC staged this same show in 2003 at the Nowra School Of Arts. We are looking forward to placing it on the professional stage of the SEC. Unfortunately we are not permitted to use the name of the show this far out from production. If your EOI depends on you knowing more details, then feel free to contact Merrin Ross, 2017 President, for a confidential chat. In your EOI please outline any substantial previous experience you have had with show production, and the role you would like to fill on the Production Team. AMTC would expect people with their individual skills, to bring them to a working team situation. Please include your contact details. RSVP by the end of the first week of August 2017.